Essex Designed AP Racing 2-piece Competition J Hook Disc Pair (Rear 350x34mm)- Ferrari 430 Scuderia | Essex Parts Services, Inc. If the disc assemblies you’re after are “Out of Stock,” don’t panic! We most likely have the components on-hand to build them immediately. After you place your order, someone will contact you within 24 hours to provide you with a firm ship date. If you have any questions, please call us at 704-824-6030. On the racetrack however, repetitive stops from high speeds generate considerably higher brake disc temperatures vs. what could ever be legally or sanely achieved on the street. Various manufacturers producing the current crop of carbon ceramic discs claim to match iron disc durability on the track, but our experience tells us otherwise. 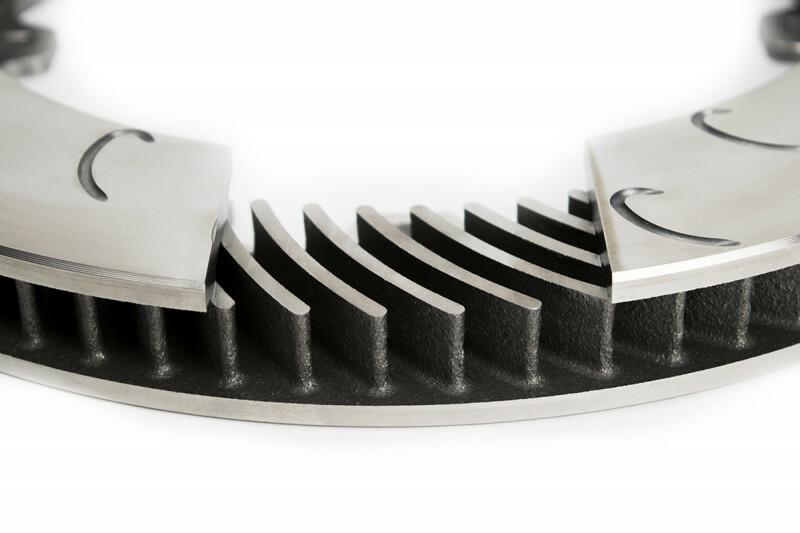 While they may be less resistant to warping or deformation at repeated elevated temperatures, the biggest problem with carbon ceramic discs is that they tend to oxidize at track temperatures, showing rough surface eruptions on the disc face. 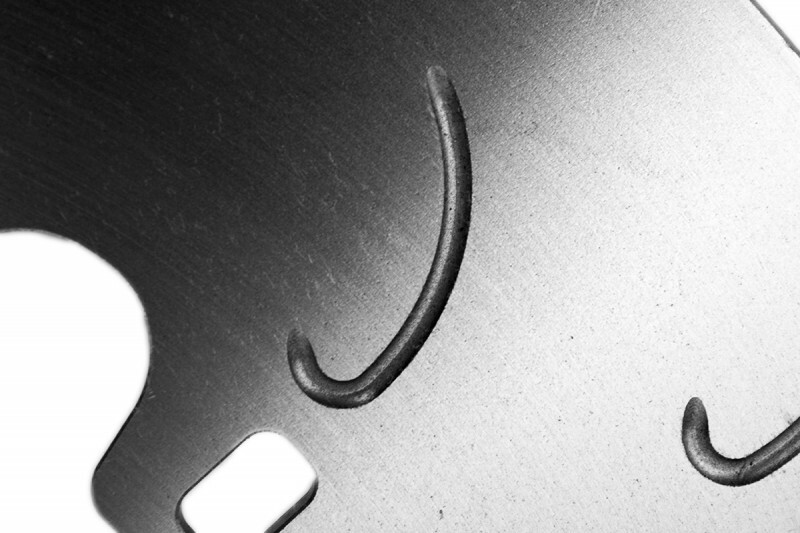 In some cases the oxidation is terminal (chopped fiber discs), and the discs must be scrapped once it occurs. In other cases (continuous fiber discs), the discs can be resurfaced, but only a limited number of times and at a high cost. Most carbon ceramic discs are measured in terms of minimum mass, rather than the traditional minimum thickness used to measure iron discs. Once the minimum mass is reached, the carbon ceramic disc is trash. Low airflow and rapid heat transfer- If you look at a specific car model that offers both iron and carbon ceramic discs as an option, the carbon ceramic discs will almost always be considerably larger in overall dimension, with a specific emphasis on a tall radial depth (distance from outer disc edge to inner disc edge). 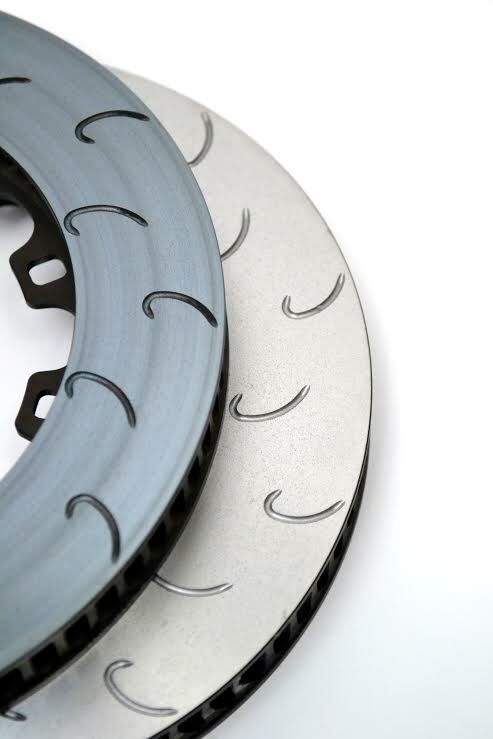 Whereas an iron disc uses a web of directional internal vanes to speed airflow through the disc, most carbon ceramic discs rely on their large surface area to radiate heat into the air surrounding the disc. Hence, the tall radial depth. Among iron disc choices, there are none better than AP Racing J Hooks. 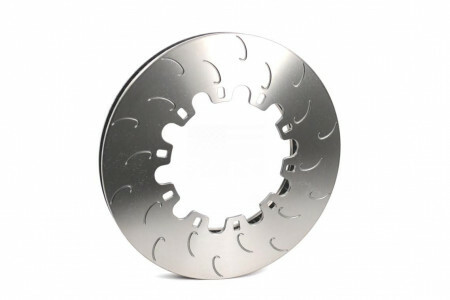 AP Racing J Hook Discs are the epitome of endurance racing components. They will hold up extremely well to any abuse you plan to throw at them. These discs have been proven time and again in professional racing, winning many races and championships (ALMS, Rolex, Grand Am, etc.). 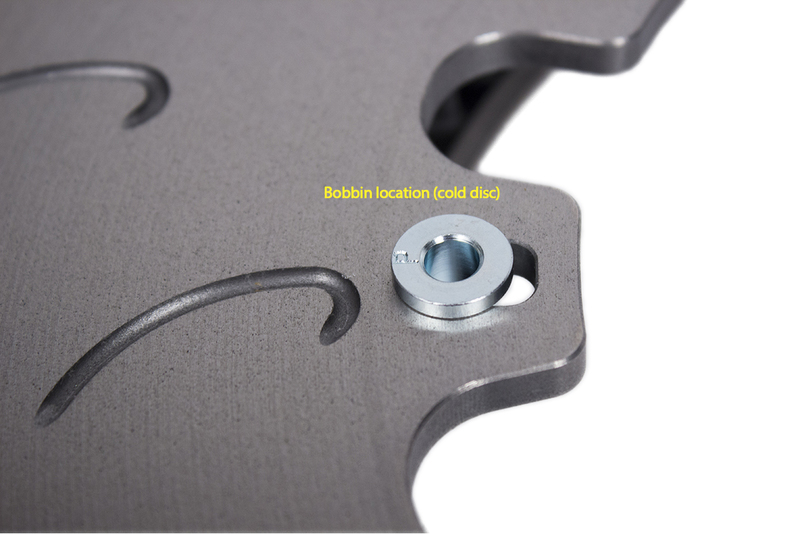 If you look closely at the mounting hardware we use on our Competition Discs, you’ll notice a few details that are often overlooked in lesser products. These components are specially made for their intended purpose. 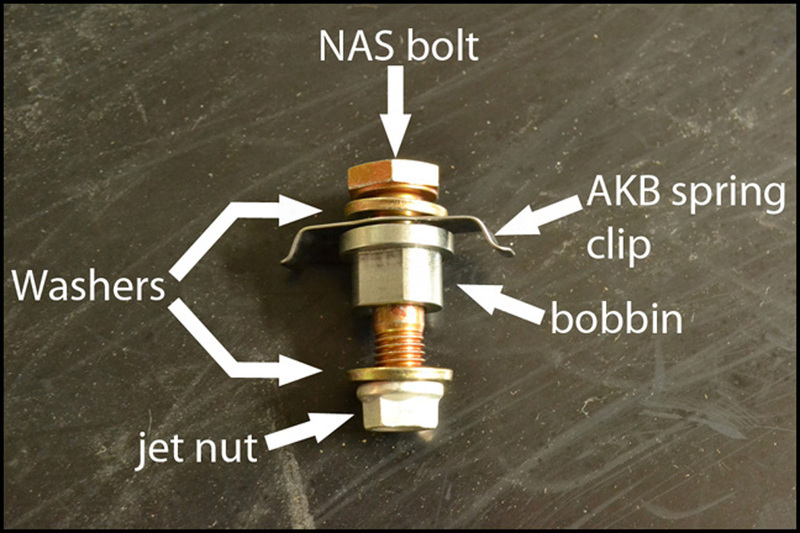 These are not cheap bolts found at your local big box store. They are custom made in the USA for Essex and AP Racing, and they are the exact same components we use on professional racing products. 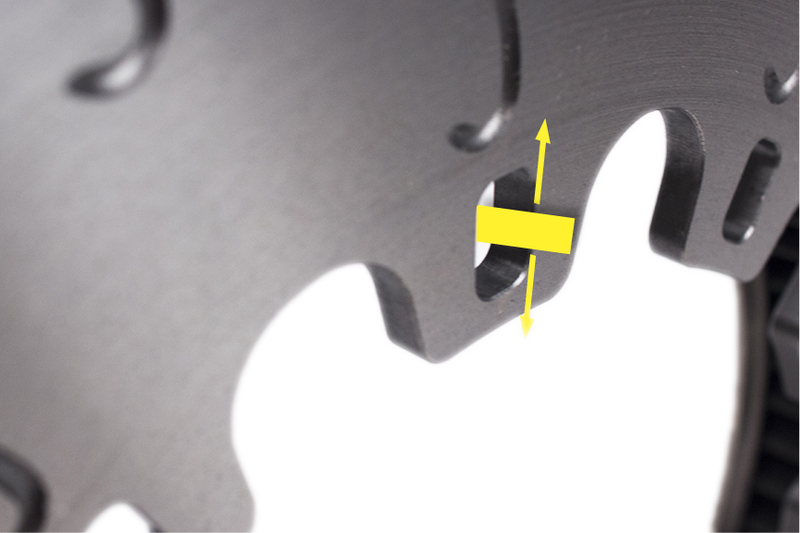 In order to help control the lateral motion of the disc, which pushes the pistons back into the caliper, we use an anti-knockback spring clip on every other disc attachment point (on a ten bolt disc there are five spring clips, while on a twelve bolt disc there are six). These spring clips help keep the disc hat and iron ring in alignment, while still allowing the disc to expand and float radially. As an added bonus, they prevent the hat and iron disc from rattling and making noise. 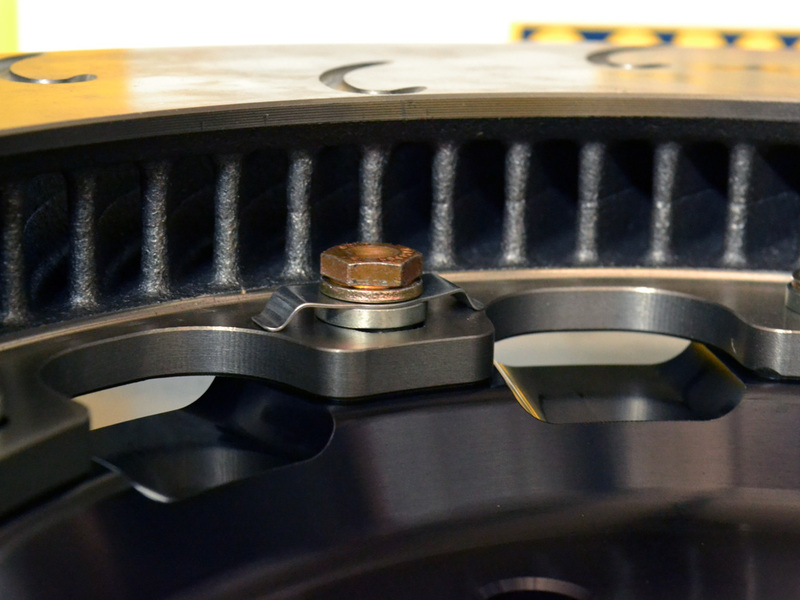 In addition to having a superior internal vane design, AP Racing discs have far more of them! 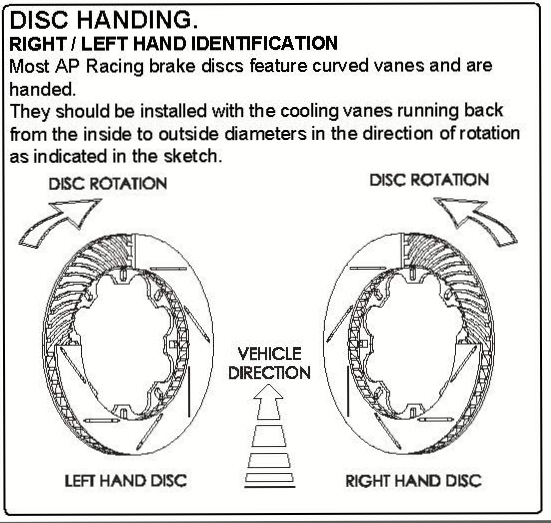 Most aftermarket discs have 30 to 48 vanes. After extensive CFD and thermal stress analysis, AP designed the Competition J Hook's with a high vane count (typically 60 to 84 depending on application). 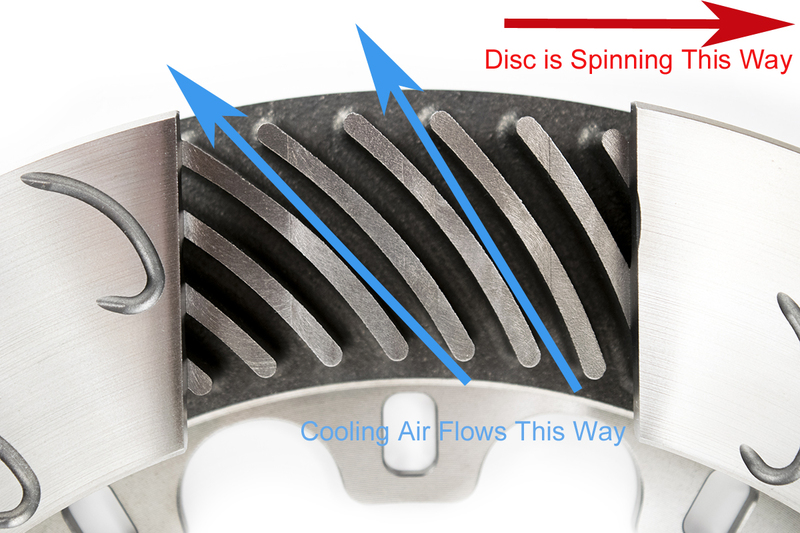 Having more vanes increases airspeed and heat transfer through the disc, reduces air recirculation between vanes, and reduces deflection at the disc face. 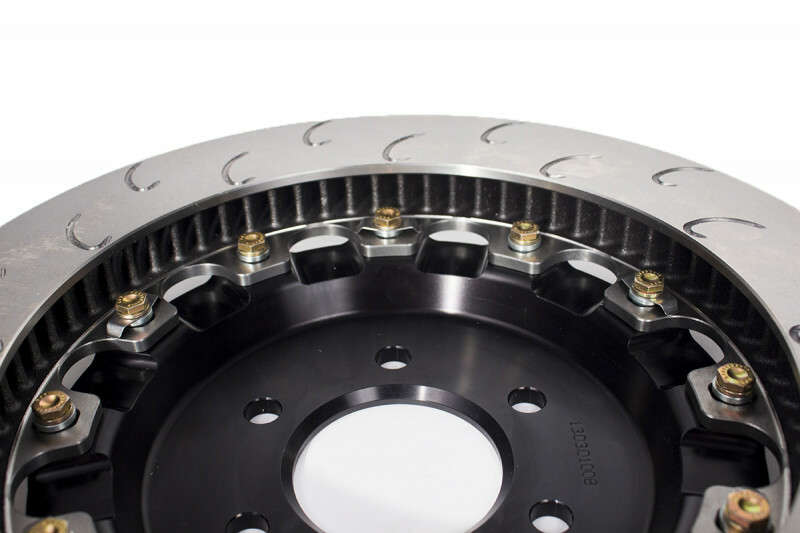 Compared to an OEM-style disc or competitor's 48 vane discs, the 60+ vane discs are less prone to coning, distortion, and cracking, while providing less brake fade, reduced judder, more even pad contact, and a longer service life. Essex is now offering a solution via our professional burnishing service. Previously reserved for our professional racing customers, we are now offering our retail customers the option of having the discs in select Competition Brake Kits pre-burnished at our factory. We burnish thousands of discs for the top racing teams each year. 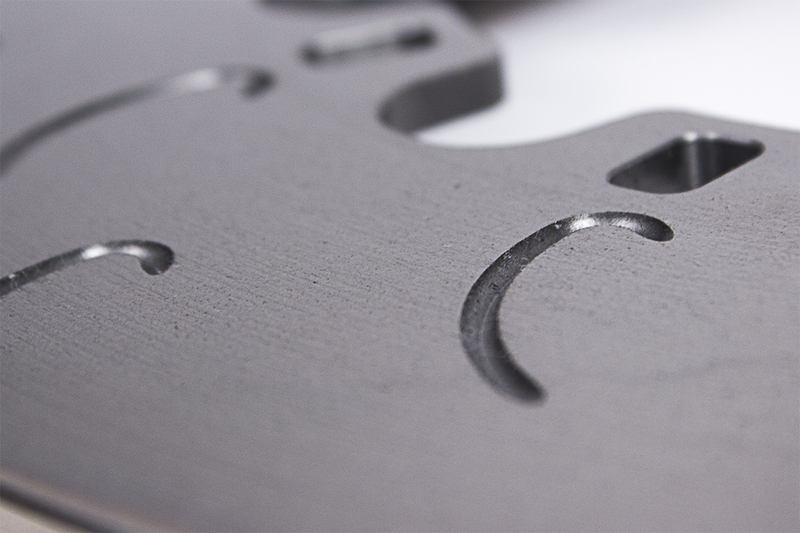 After countless hours of experimentation, and extensive feedback from the top drivers and teams, we can consistently squeeze the most reliable performance out of AP Racing's discs. The procedure is incredibly repeatable, as it is performed on a computer-controlled machine by experienced technicians. The cost of our burnishing service is only $50 per disc, making it an affordable, time-saving option that will produce far more consistent and safer results than trying the procedure on your own. Let's face it, no matter how good a brake disc is, it's still a consumable item. They're no different than brake pads or gasoline. You beat them up until they crack to pieces, then you throw them away. If replacement iron is too expensive, you're always driving in fear, waiting to shell out big bucks for a new set. 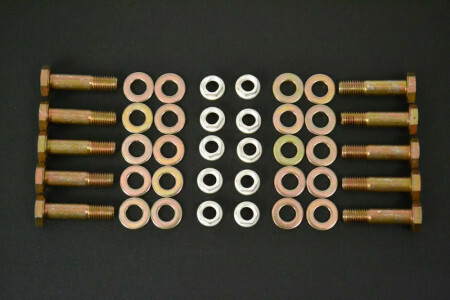 Despite having the most expansive set of features on the market, our replacement iron rings are completely affordable. Going to the track is expensive! Event entrance fees, hotels, fuel, and tires all add up. While you obviously want the best product available, you can't afford to pay a small fortune for something you're just going to destroy. You can buy a cheap set of $150 discs for every event, have relentless heat issues, and find yourself constantly swapping them out. When you do the math, the long-term value of the AP J Hook's is tough to beat. You'll enjoy all the benefits without breaking the bank, and you'll spend more time driving and less time wrenching. Q: Where can I buy your discs? 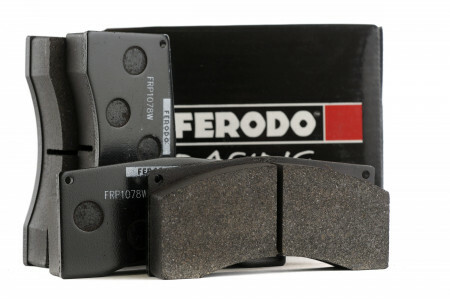 Q: Do you have a brake pad that works well with these discs on both the street and the track? A: No! Street pads are designed to chase groceries, not lap times.If you overheat a street pad beyond its max operating temperature, you risk not only destroying those pads, but your discs as well.Essex always recommends using street pads on the street, and race/track pads on the track.Please see "How to Choose the Best Street and Track Brake Pads" for a more detailed explanation and guidance on pad choice. Q: Do I have to modify my car to install your discs? A: In almost all cases, no.If not otherwise noted, the discs will drop onto the car without any required modifications.On a few of our disc kits caliper spacers and longer caliper bolts are needed.For those applications, we include the spacers and bolts.Again though, unless otherwise noted, the discs will bolt onto the car without doing anything else. Q: Will your discs significantly shorten my stopping distances with all else held equal? A: No! Tires stop your car.Brakes turn the energy of the spinning brake discs into heat.The primary function of a properly designed big brake kit to withstand the heat encountered during the repetitive and heavy use of the brakes.Anyone who sells you a brake kit specifically to shorten your stopping distances is lying to you.If you want shorter stopping distances, buy stickier tires. If you want your brakes to feel exactly the same on the last lap of the day as they did on the first lap, buy our brake discs. Q: I saw that your discs reduce unsprung weight…will that help me? A: Yes! Reducing unsprung weight not only improves braking performance, but also translates to superior acceleration and cornering as well.As is the case with switching to a lighter wheel and tire combo, installing lighter brake components can improve your car's overall performance envelope. Q: Are spare iron disc rings available and reasonably priced? A: Being a company brimming with racers and track junkies, we're very aware of the costs of running a typical track event schedule for the year...event fees, gas, hotels, tires, etc. It all adds up quickly. When we created our Competition Disc product line, availability and long-term running costs were of paramount concern.We did a couple of things to address these issues.First we're buying loads of spares and keeping them on the shelf in our warehouse in Charlotte, NC.Buying in bulk also brings the cost down, so we can pass them along at prices that may surprise you for a premium European brand.When you look at the specification of our discs vs. the competition, AP's racing heritage, and the longevity you'll get from them, they are an incredible bargain.Most of the competitive discs on the market are 48 vanes or less, weigh more, have less optimized vane design, inferior metallurgy, and have never been proven under the same conditions as the AP Racing discs.Many of our race customers have run an entire season or more on a single set of discs. Q: I have a vibration or judder when I press the brake pedal. How do I get rid of it? A: What you are experiencing is most likely an uneven brake pad deposition on the disc face.What that means is brake pad material is stuck to the face of your brake disc in splotches and patches.On a properly bedded/burnished disc, that material is evenly distributed around the disc.If it is unevenly smeared on the disc, high spots are created on the disc face.Every time you press your brakes and the pads come in contact with that high spot, you feel it as a judder through the brake pedal and/or steering wheel.Our recommendation is to first try and remove those high spots by driving an aggressive set of race pads cold.When you drive race pads cold, they scrape material from the disc, rather than depositing material on the disc.In this manner you can "clean" your discs.To see this process in action, check out our video "Swapping Between Street and Race Brake Pads." 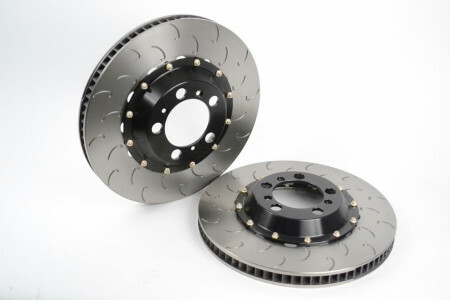 Q: I live in (country outside of North America).Can you ship me your brake discs? A: Due to contractual obligations with AP Racing, Essex only ships to physical addresses inside North America, or to a territory in which there isn't currently an authorized AP Racing distributor.To see if there is an authorized AP distributor in your area, please click here.Your other option is to contact one of our current authorized dealers and see if they can help you. Q: What about driving with your discs in foul weather conditions? A: We've had a few rally customers ask about foul-weather performance .Any aftermarket discs will require similar maintenance and present the same problems in foul weather conditions. The most vulnerable area for problems is the attachment point between the iron disc and aluminum hat. 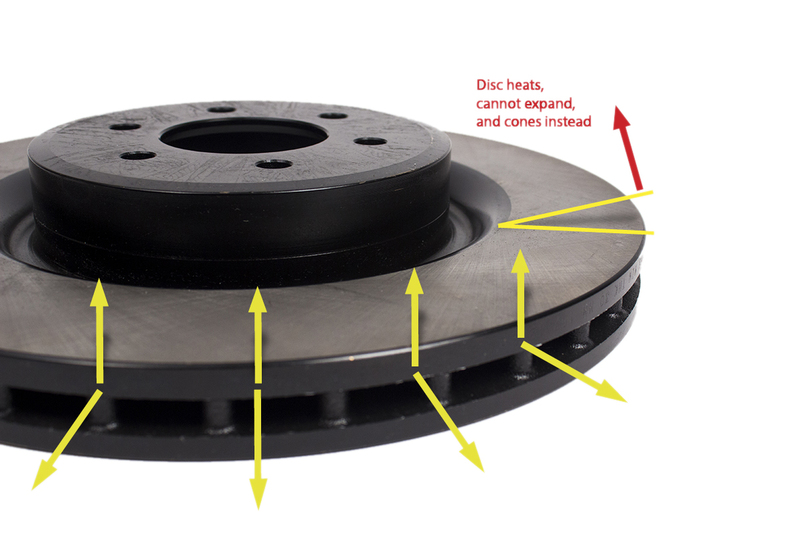 That's why you don't see a whole lot of OEM two-piece discs using an aluminum hat.Over the years many OEM's use a dual-cast iron design with as few moving parts as possible. What happens is, that road salt and other gunk gets wedged between the hat and iron disc ring, and it is essentially impossible to remove short of taking the disc apart. The salt eats away at the aluminum hat, eventually flaking, chipping, etc. 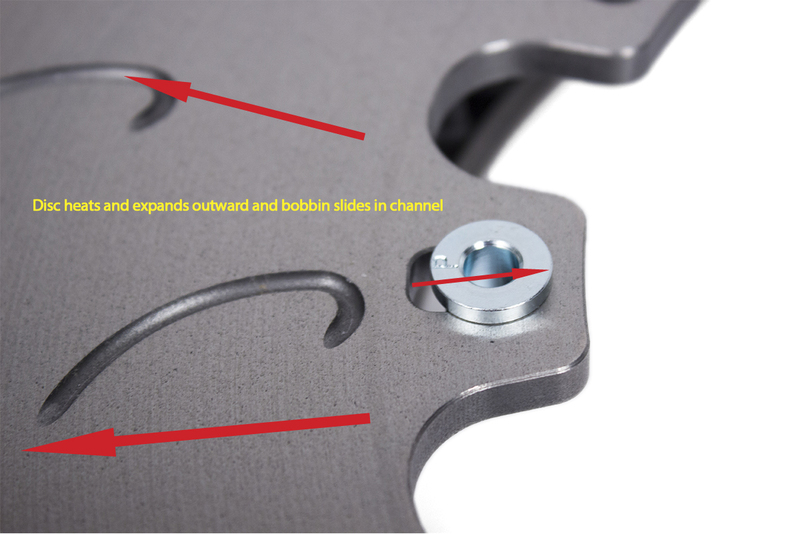 Again, this is a problem that will be encountered on ANY aftermarket brake discs with an aluminum hat (FYI…the same sort of things happen with the caliper brackets on just about ANY aftermarket BBK. They're almost all anodized aluminum). Our recommendation is that if you are going to be driving the discs in inclement weather, we recommend disassembling and thoroughly cleaning them with soap and water on a regular schedule. 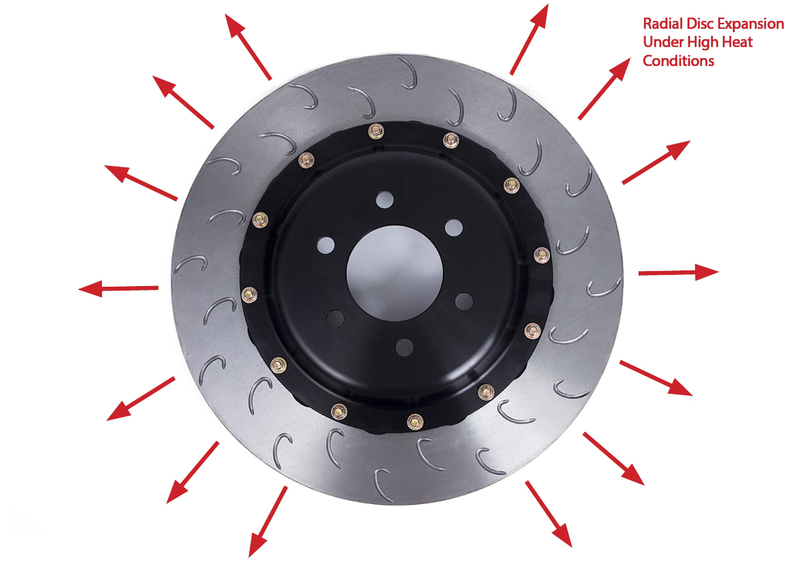 Q: Are your brake discs road legal? A: All of the brake products Essex sells are designed for off-road use only.If you read the fine print on any aftermarket big brake kit, from any manufacturer, you'll find the same thing...for off-road use only.We don't design our brake discs to meet any government standards, as there is no such standard or requirement in the USA for brake discs.There are however some regulations on brake hoses/lines and brake fluid.All stainless steel brake hoses and brake fluid that Essex sells are DOT compliant.Please read below and click the link for more details and info. 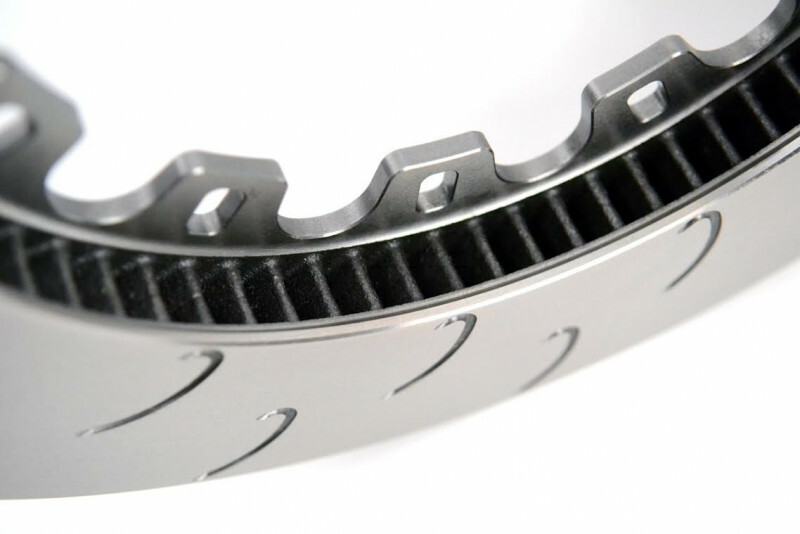 Q: Do your brake discs come with a warranty? A: No.The disclaimer of warranty below appears on the first page of the install manual inside the box of every Essex Designed Competition Disc Kit.That said, if you order discs and there is something blatantly wrong when you open the box (the wrong size of disc is inside, etc. ), we will do everything in our power to correct the situation immediately.We have stringent quality controls in place to prevent such a situation from occurring, and in all cases, multiple employees handle and check our products for issues before they go out the door. By purchasing this product and opening this box, purchaser expressly acknowledges, understands and agrees that they take, select and purchase this brake system, parts, and equipment from Essex Parts Services, Inc., its affiliates, suppliers, distributors, and agents (collectively, “Essex”) “as is” and “with all faults.” The entire risk as to the quality and performance of this brake system, parts, or equipment is with the purchaser. Should the goods prove defective following their purchase, the purchaser assumes the entire cost for all necessary servicing or repair or any resulting liability. Essex is not responsible for any damage, consequential or otherwise, for equipment failure or mal-performance after installation. Essex makes no warranties whatsoever, expressed or implied, oral or written, to purchasers or any users of these products. Essex expressly disclaims any implied warranty of merchantability or warranty of fitness for a particular purpose, including fitness of these systems, parts or equipment for racing or road use. No warranty or representation is made to the product’s ability to protect the user from injury or death. The user assumes all risk.By purchasing this product and opening this box, purchaser expressly affirms that they are relying upon their own skill and judgment in selecting and purchasing these goods as suitable for purchasers’ intended use. Purchaser understands and agrees that no officer, director, salesman, distributor, or agent of Essex has any authority to make any statement contrary to the terms of this disclaimer and agreement. On the contrary, Essex disavows any statement contrary to what is written above. See these discs in action in our Customer Gallery.